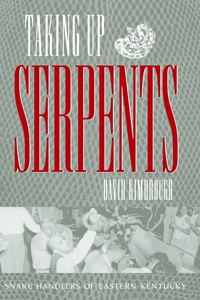 In Taking Up Serpents: A History of Snake Handling Kimbrough explains the history and practice of serpent-handling believers from the perspective of a respectful and scholarly participant-observer. While this is a story of Kimbrough's experiences with the Saylor family of Eastern Kentucky, Kimbrough explains the origins of serpent handling as they emerged in the teachings of George Hensley of the Grasshopper community near Cleveland, Tennessee. Churches that practice snake-handling have dotted the Appalachian mountains for over 100 years, but not until now has their story been so consistently and faithfully written by an author who is both a participant-observer and a Ph.D. historian. Having an Appalachian background himself, David Kimbrough studied, observed, participated with, and befriended many individuals in this unique expression of faith: the handling of snakes. This activity is understood not as a test of God's care and protection, but in fulfillment of the command of Jesus himself, that if done in his name then no harm would come to them. The exception to this is if the person is not right with God, then injury and/or death could follow. It was a test of the person's faith. Believing wholeheartedly that such an act was not only appropriate but commanded, churches practicing the handling of snakes and the drinking of poisons have often been labeled as cultic in nature, but, according to Kimbrough, nothing could be further from the truth. These are people who truly believe in taking the words of the New Testament seriously. This wonderfully-researched and engrossing book is the most complete account of the people and the churches that practice the handling of snakes in their worship of God.